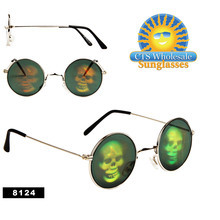 Favorite Hologram Sunglasses Back in Stock - CTS Wholesale LLC. Customers will be happy to hear about the return of favorite Hologram Sunglasses, and even a few new ones. This month CTS is excited to announce the return of both Pot Leaf & Smiley Face Holographic selections, in addition to a few creepy skull holograms. For those who don't know, wholesale hologram sunglasses are made with high quality glass lenses, and boast a metal frame. The entire selection is sold for just $24 a dozen, making these a great investment for retailers & resellers. With no minimum ordering requirements, they're priced for personal shoppers too! $24 a dozen! Get 'em now!